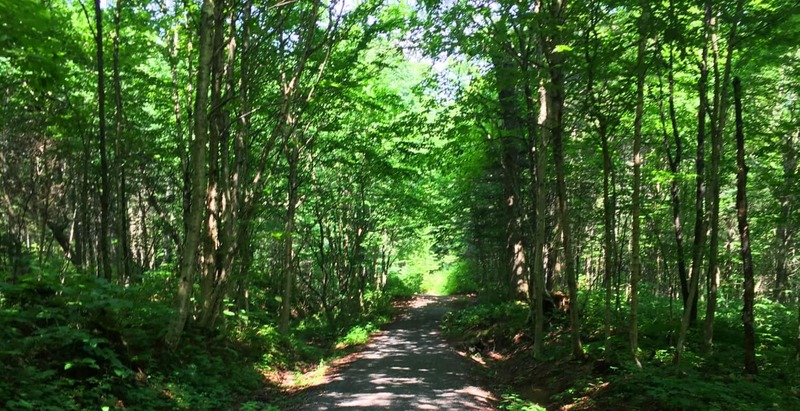 Note: Tully Lake Trail is nothing less than a kingdom of cut stones enveloped by gorgeous old growth forest in the heart of New England. The main trail loops down along the lake for about two miles, and then back into the elevated forest for another five. 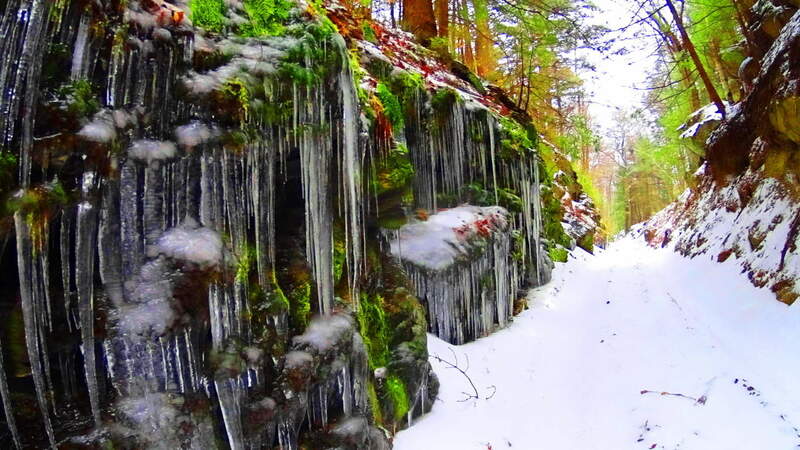 It is a challenging hike in winter, but enchanting. 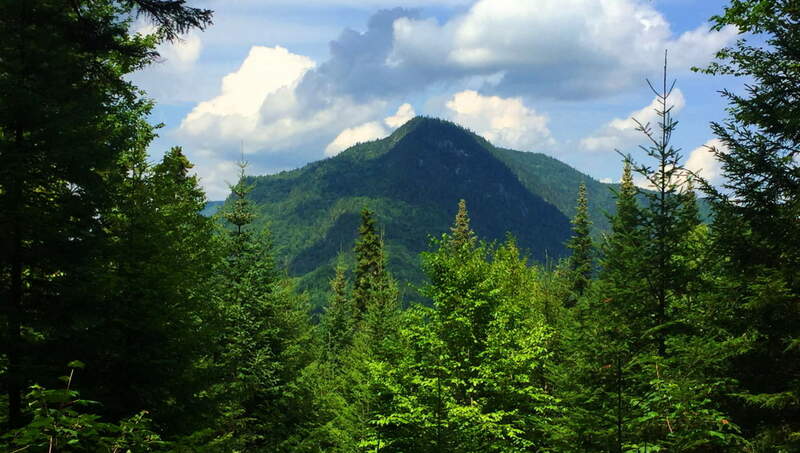 As you begin to progress into the glades of tall pines, birch, and maple, it becomes impossible to ignore the crafted megaliths lining the hillsides. It becomes abundantly clear that whoever engineered these incredible stones wanted them to be noticed. 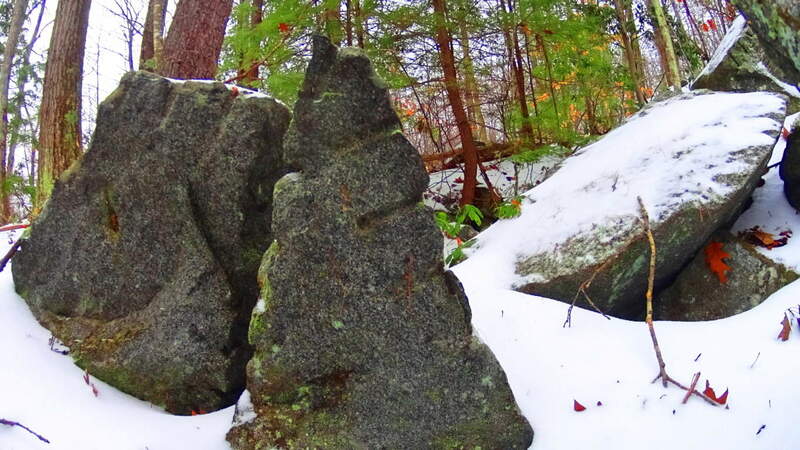 It is a venerable masonic work area, with standing stones, cut boulders, stone linings, and ancient stone dwellings. 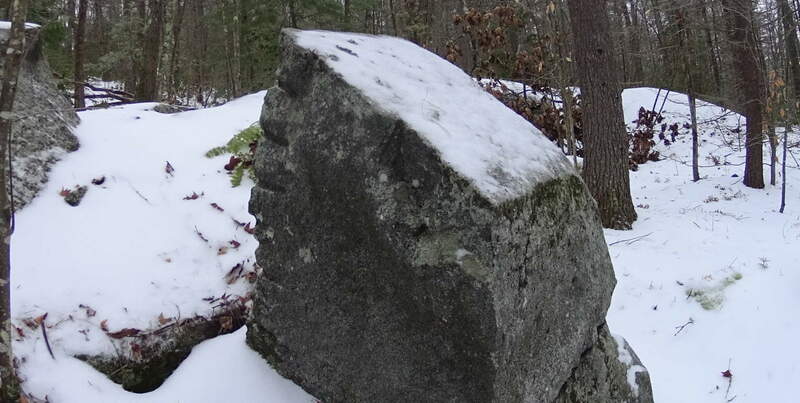 Furthermore, the stonework is not arbitrarily placed, but is clearly set in a specific manner, although beneath a blanket of snow it is difficult to decipher on a blustery December day. The clarity of the markings on these stones is astonishing. 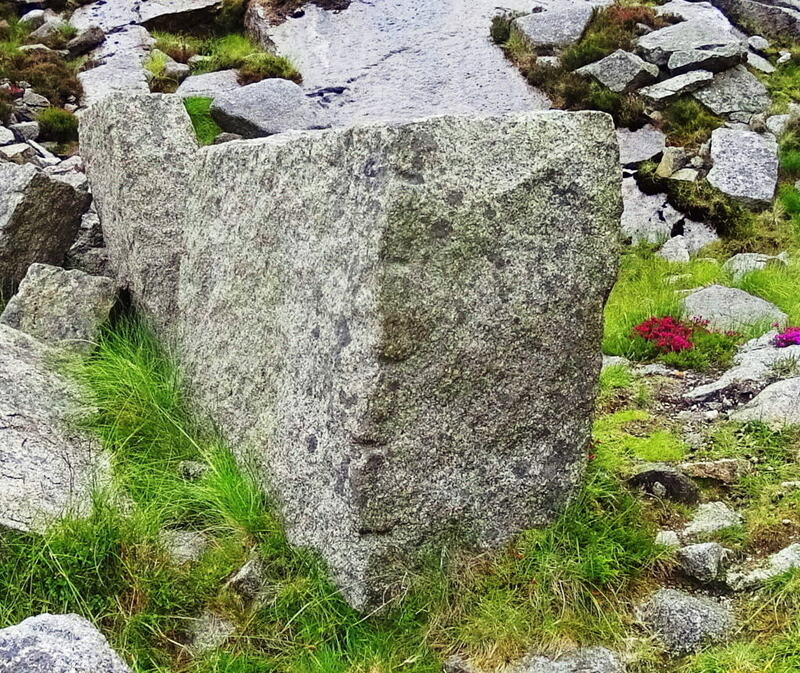 Similar styles of measurement for the cutting of megaliths exist at Mount Bearnagh in the Mourne Range of Ireland, and also most notably in the Lynn Woods further east of here in Massachusetts. Observing the scale of what are clearly measurement markings for cutting, (which I must add is certainly not inches, but some other grand standard) allows us to consider what the craftsman of the stones considered to be ‘scale’. And that scale is MASSIVE. The stones also reveal incredibly complicated curvatures, extremely hard to create in large granite pieces. The entire forest is inundated with stone statements that cry out for observation. 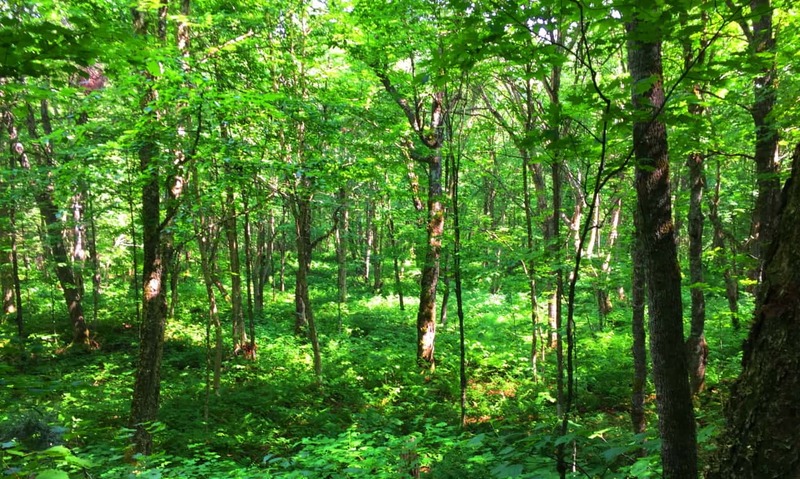 Consistent with other old-growth trails all over the world, this forest contains the remnants of what I believe is the one time home of the craftsman of this area. Sitting roughly four miles into the loop of the main trail, unlabelled in any way, to the right of the pathway while heading back towards the entrance, I saw an incredible stone foundation of what was once clearly someones home. This site featured a beautifully dry-laid and grand cut-stone looking to weigh at least 2 tons, embedded perfectly into the foundation. The amount of care and effort that went into placing just this one megalithic center-piece must have been challenging. 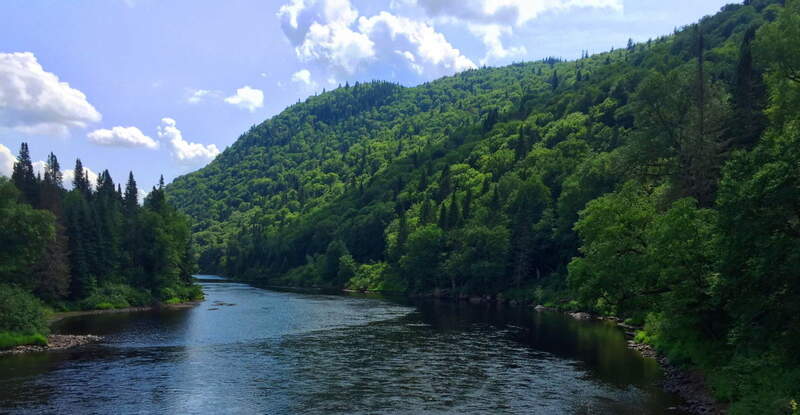 With sites like this, a trail becomes a priceless anthropological zone on the level of Tollymore Forest in Ireland, and Monument Mountain in the southern Berkshires of Massachusetts. 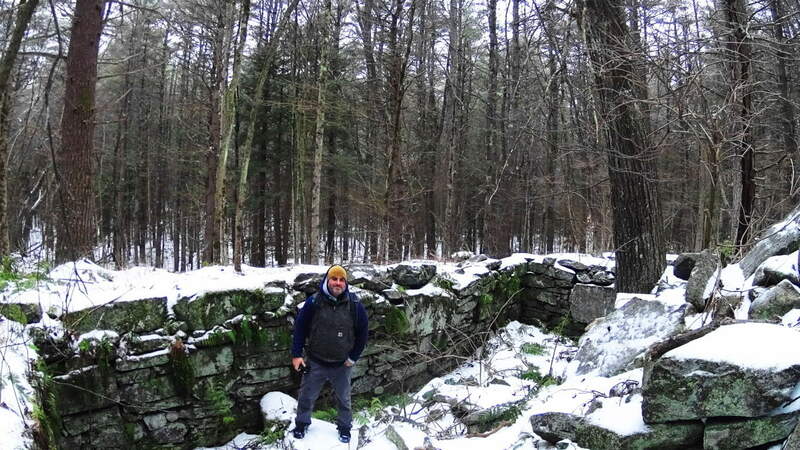 To find an ancient dwelling, or one definitive standing stone in a single New England forest is rare, but to find several is truly exhilarating. Further along the trail there is a stone connected to a stone-lining (‘wall’) looking very much like a Celtic ‘directional stone’, almost identical to types I have seen in England. 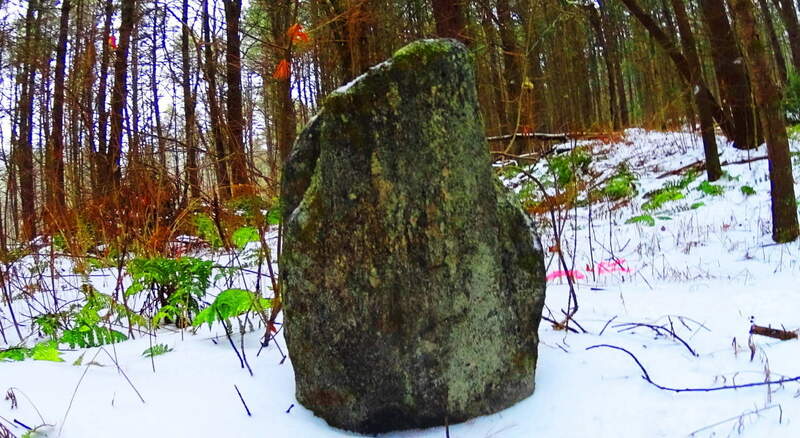 Celtic areas have preserved these stones and properly noted them as important anthropological statements from a culture perhaps 6000 years in the past, but New England has failed to do so here. 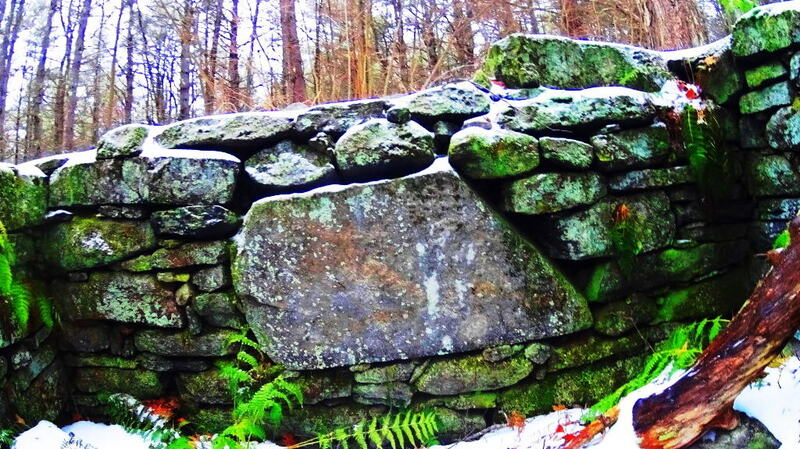 Ironically, this somehow makes New England’s ancient sites feel a bit more pristine than even Celtic areas that are well known, because the stones have not been touched, or even visited by anyone knowingly seeking the works of a neolithic culture. 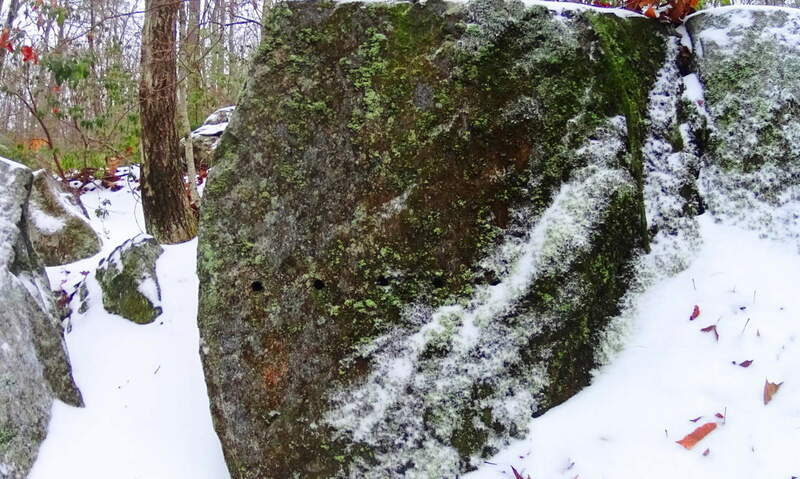 When considering that almost every massive boulder in the forest contains some form of crafting, whether it be boulders split in half, or simply marked by incisions of some type, the amount of energy that would have been put into this effort is astounding, and so worth noting. And all the time, behind fixture after fixture of colossal craftsmanship, is mile upon mile of zig-zagging stone linings sliding through the trees. Close consideration of these works reveal that these efforts are not mere random ‘holes’ in the rock, but linearly lined incisions. 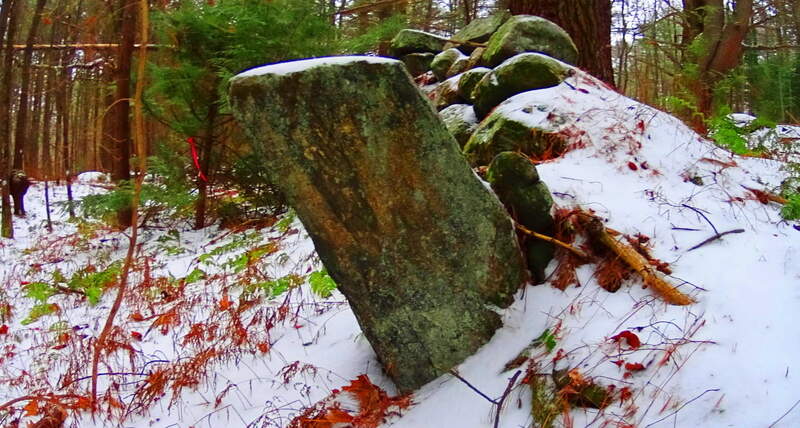 And cuts along the edges of these megaliths are measurements, not random markings. Some of the craft work is truly artistic, revealing a joy in the artistry. Some stones are set in pairs, others are laid out as massive fixtures, seeming to have a functional flare. 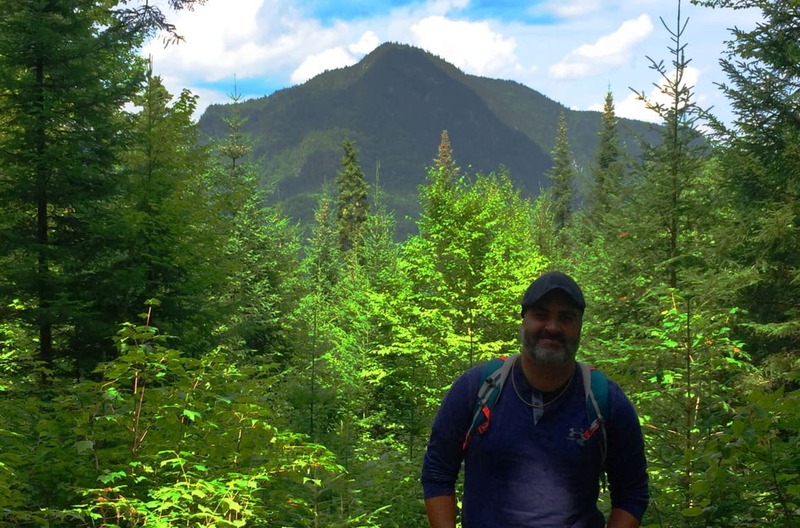 Hiking through these pathways is a pure wonder that pushes the boundaries of our understanding of what might have taken place clear back to the beginning of Time. The stones themselves seem to insist that it may not be the linear evolutionary line that postmodern texts have been pushing for the last 100 years. 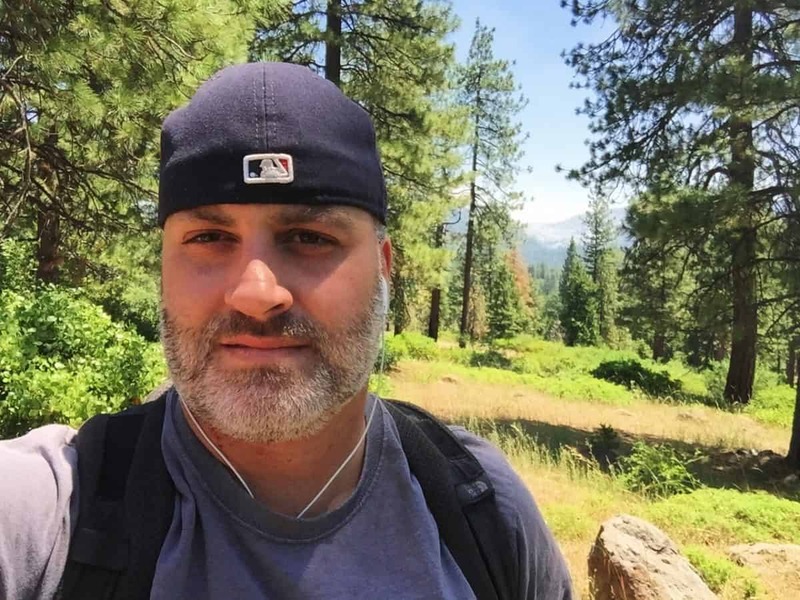 It is clear that technology existed in antiquity, and was utilized in this incredible daydream of a forest. 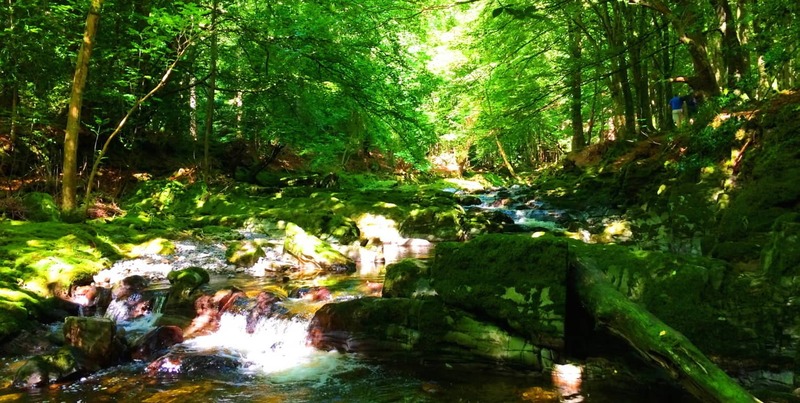 On an international scale of 1 to 10 for sacred forests, Tully Lake is a 15. Seek and find it out for yourself, something truly magical took place here. Scale: 10 feet height, 2.5 feet width, 1 ton weight. 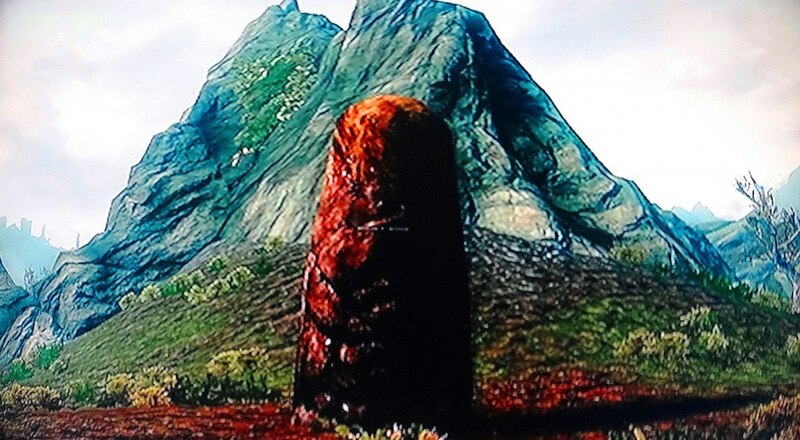 Note: This animated digital landscape in Skyrim is purely inspirational. Due to scenes like these, I decided to find the real thing every summer. So glad I did. I will continue to post these every so often to entice people to play this game, and also find the real thing at Celtic places. You can do it.